The Drexel University men’s basketball team played James Madison University in the opening round of the Colonial Athletic Association tournament March 3. Drexel was the eighth ranked team going against James Madison who was ranked ninth. At halftime the Dragons trailed by three points. Tramaine Isabell struggled in the first half shooting only 1-8. In the second half however, Tramaine started playing in a way that everyone has come to expect after his breakout season this year. Isabell scored 20 points in the second half, including 12 in the final four minutes. The Dragons outscored James Madison 40-29 in the second half, to give them an overall victory of 70-62. Despite the victory, Isabell was the only Dragon to reach double figures. Drexel outscored James Madison’s bench 30-10, including 20 in the second half compared to James Madison’s zero. Another impressive stat for the Dragons in this game was having 11 blocks in contrast to James Madison’s three. 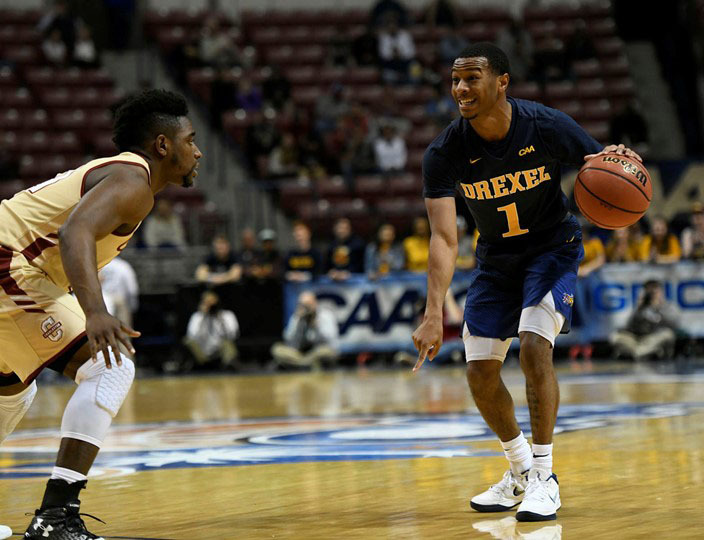 Drexel played their second game of the CAA Tournament against number one seed, the College of Charleston March 4. Drexel came to play in this one as Charleston only led by three points at halftime. Drexel kept it close in the first half, never going down by more than five. Drexel had a hard time containing Charleston Senior Joe Chealey who finished the game with 22 points, five rebounds and three assists. Kurk Lee led the Dragons with 15 points and three assists. The Dragons exploded to start the second half, roaring back by hitting their first six shots to open the frame. After Isabell drained a free throw with 10:50 left, the Dragons had a comfortable nine point lead over the heavily favored Cougars. Unfortunately, Charleston then went on a 26-11 run in the final 10 minutes of the game. The final was 66-59 in favor of Charleston, ending Drexel’s hopes of a fairy tale run to the National Collegiate Athletic Association tournament. While Drexel didn’t finish the season above .500, head coach Zach Spiker has to be pleased with the improvement that his team has made this year. The team increased its record by 4 wins from last year and gained a star in Tramaine Isabell. Let’s not forget that the Dragons made history this year in their 34-point comeback against the University of Delaware.